The last blog listed quite a few jobs that needed doing on La Mouette. The toe rail and winch maintenance just to name a couple. Sadly, those jobs are still on the to-do list, as are some fibreglass repairs, however, they will get done and hopefully soonish. Someone has stolen my diary again and used it to book up a lot of the empty weekends, so boat repairs and maintenance hasn’t been possible. But we did manage to get a weekend away, which is always good. 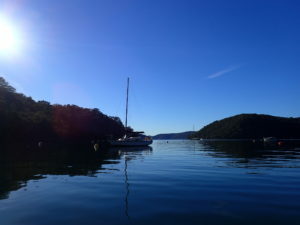 Winter is a really good time to go sailing and boating. Although it’s cold, and the wind can be quite deadly, if you get a good day with plenty of sunshine, it’s just as good as summer. You just have to wear a jumper or a jacket. Winter sailing is probably better in fact. There isn’t as much traffic out there on the waterways and you basically have the more popular anchorage spots to yourself. We tossed a coin whether to go out to Smith’s Creek or good old Refuge Bay. In the end, Refuge Bay won out because we thought we might get a chance to put the sails up, whereas Smith’s Creek is extremely sheltered and also narrow, so sailing isn’t really an option. We had a glorious weekend, sunny, but alas, no wind, so the motor got a good workout. That’s not a bad thing as they need a good run on a regular basis. Refuge Bay was practically deserted, the exact opposite to Easter when it was jam packed. It was a really peaceful spot to spend the night. 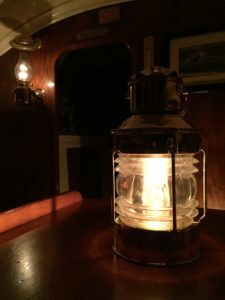 It got quite chilly at night and the only heating we really have is the two kerosene lamps. These put out a warm light and take the edge of the chill in the cabin. We were rugged up with our winter woollies and spent the evening enjoying a bottle of wine and playing games such as Yahtzee. The downside of winter cruising of course is the cold. We brought our doona with us and were quite snug in the v-berth, but the coldness meant that the condensation quickly forms on the fibreglass surfaces and we were constantly being woken up in the night by drips on the head. I have since been told that you can avoid this by lining the cabin roof with a material lining and also by having heating aboard. I am not keen on those butane camping stoves, as they can emit carbon monoxide, leak butane or simply burn the surroundings – not to mention falling over whilst lit. However, in a calm anchorage, this is against the odds but it could happen. A quick look at ebay uncovered the existence of metho heaters. Basically the Dometic Origo metho stove unit built into a heater. It looks like one of those Trangia stoves that the hikers use. They aren’t cheap but might be a good solution and I will seriously think about it for the next winter. Getting in and out of the berth at Akuna Bay was the easiest thing, not at all like the troubles at the Booker Bay marina. We did have help getting out of the berth as full keel yachts such as Compass 28’s don’t reverse particularly well, and got back in the next day by ourselves. No dramas, no raised voices, no nothing. I let the boat cruise up the channel in the marina and gradually throttled off and let the boat slow down. By the time we were level with our berth, it was just making weigh although we still had steerage. A turn to starboard and then started to line up on the berth. La Mouette just glided into the slip nicely and putting it in reverse just stopped it dead, exactly in the right spot. Deb just stepped off with the mooring line in her hand and I quickly stuck it in neutral, and stepped off myself. It was as simple as that. I think we are going to enjoy being at Akuna Bay. Then followed the inevitable couple of hours of scrubbing, stowing and packing. But the toe rail and winches are still there waiting for me. They won’t go away by themselves and the only way that it’s going to get done is by biting the bullet and getting stuck into it. However, if the chance of a sail presents itself, then the jobs might get postponed. This coming weekend is looking like a good one and I think I shall schedule Saturday to service the winches and fix the bit where the toerail is coming loose. The sanding and Cetol will be done a bit later as Sunday is shaping up for a day to go sailing. The Sydney Boat Show is also looming closer and only a fortnight away, although we might just take a flex day and visit it during the week when the crowds won’t be as bad. It’s all looking good and the move to Akuna has proved to be the right choice, although it’s still early days yet. The marina facilities at Akuna are currently getting a refurb and a street kitchen opened up last week to cater for the marina people as well as the passing cyclists and weekend tourists. I spend last Sunday doing odd jobs on the boat and tried out their coffee and some fish and chips. It was quite pleasant sitting in the cockpit having lunch in the winter sunshine. But the best bit of all is that the docking at the marina is so easy. 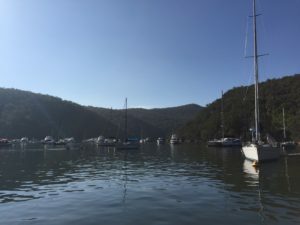 In fact it is so easy, that it is extremely tempting to have a go at doing it solo and getting in some sailing experience whilst Deb is busy working when she is rostered on for weekends. But more of that next time.